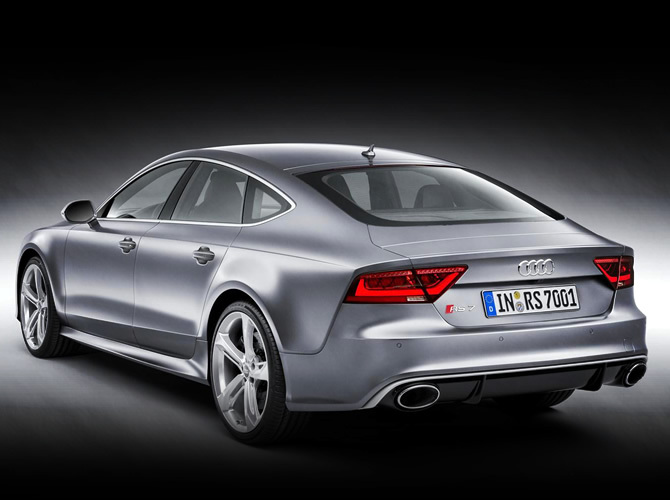 Audi is expanding its RS model lineup: The RS 7 Sportback, which is making its debut at the North American International Auto Show 2013 in Detroit, stands for dynamics at their most beautiful. The large five-door coupe uses a 4.0 TFSI engine producing 412 kW (560 hp). The sprint from zero to 100 km/h (62.14 mph) takes just 3.9 seconds, and the speed governor can be deactivated upon customer request to permit a top speed of up to 305 km/h (189.52 mph). Despite this superior performance, the Audi RS 7 Sportback consumes on average just 9.8 liters of fuel per 100 km (24.00 US mpg). Aesthetic design, innovative technology and impressive sportiness: The RS 7 Sportback, the large five-door coupe from Audi, combines many strengths to produce a fascinating character. Its strong heart is the 4.0 TFSI, which takes Audi’s downsizing strategy to the high-end category. The twin-turbo V8 displaces 3,993 cc and develops awesome power, with 412 kW (560 hp) available between 5,700 and 6,700 rpm. A constant 750 Nm (553.17 lb-ft) of torque are available between 1,750 and 5,500 rpm. Because the high-revving four-cylinder engine has been rigorously designed for low load-change and flow losses, it develops this power quickly and spontaneously. The cylinder heads have the exhaust side on the inside and the intake side on the outside. The two twin-scroll turbochargers, which produce up to 1.2 bars of relative boost pressure, are located together with the intercooler in the inside V of the cylinder banks. Consequently, the gas paths are very short and response very good. The RS-specific engine management and unthrottled intake system also contribute to the dynamic character of the twin-turbo V8. Switchable flaps in the exhaust system make the engine sound even fuller at the push of a button or under strong acceleration. Audi also offers an optional sport exhaust system. 305 km/h (189.52 mph) with the dynamic package plus. Yet the new top model of the model series consumes on average just 9.8 liters of fuel per 100 km (24.00 US mpg). This top value is due in part to the standard start-stop system and innovative thermal management. 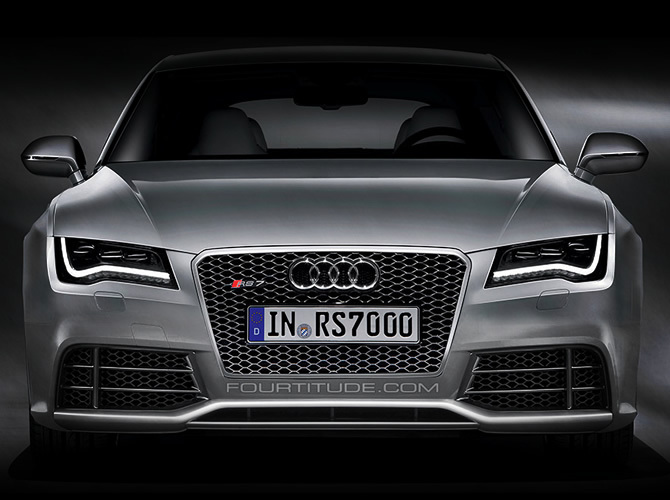 The standard eight-speed tiptronic is specially tuned to the sporty character of the Audi RS 7 Sportback. Drivers can choose between the modes D and S or change gears themselves using the shift paddles on the steering wheel or the selector lever, which sports a unique RS design. While the lower gears of the tiptronic are closely spaced for sporty response, eighth gear is tall like an overdrive to reduce fuel consumption. The Audi RS 7 Sportback comes standard with quattro permanent all-wheel drive for its decisive advantage in traction and driving safety compared with its two-wheel-drive competitors. At the heart of the quattro system is a center differential with a high locking rate and a separate oil cooler to regulate its temperature. It distributes the power as needed within a wide range between the front and rear axles. In the standard configuration, 60 percent flows to the rear and 40 percent to the front. 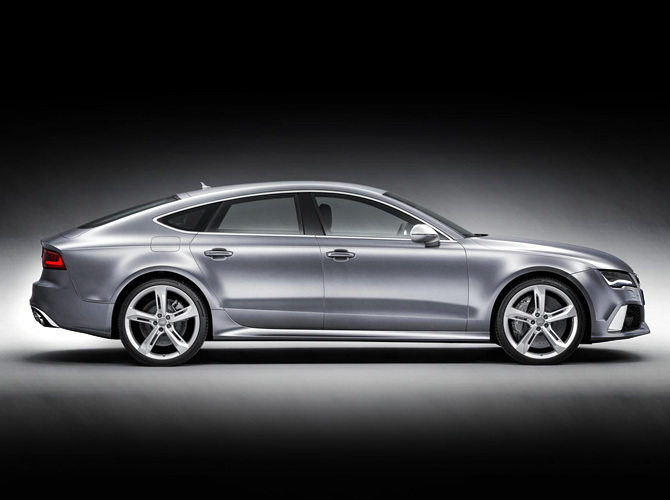 The Audi RS 7 Sportback comes standard with polished, 20-inch forged lightweight wheels in a seven twin-spoke design. The five-door high-performance coupe also rolls on optional 21-inch cast wheels in a choice of three designs. Powerful brakes are located behind the large wheels. The four internally vented discs feature a weight-saving wave design and measure 390 millimeters (15.35 in) in diameter up front. Pins decouple the steel friction rings from the aluminum brake caps. Black painted six-piston calipers – optionally available in red – grip the discs. 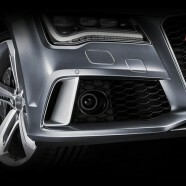 Audi also offers optional 420 millimeter (16.54 in) carbon fiber ceramic discs with anthracite gray calipers. The electronic stabilization control (ESC) has a Sport mode and can also be deactivated entirely. Equipped with the air suspension, which harmonizes perfectly with the dynamic character of a sport coupe, the new RS 7 Sportback is sporty, yet still comfortable. The RS 7 adaptive air suspension lowers the body by 20 millimeters (0.79 in). Adaptive damping, another of the system’s features, adjusts the suspension’s response to the condition of the road, the driver’s style and the mode selected in the Audi drive select system, with which the driver can alter the function of key components in multiple steps. Audi offers the taut sport suspension plus with dynamic ride control (DRC) as an alternative to the air suspension. It uses steel springs and three-stage adjustable dampers that are connected to one another via diagonal oil lines and a central valve. Another option, which can also be integrated into Audi drive select, is the dynamic steering with its steplessly variable steering boost and ratio. As with the standard electromechanical steering, its characteristics are specially tailored for the RS 7 Sportback. Colors and materials provide for further differentiation. The footrest, pedals and soft keys in the standard MMI navigation plus terminal shine in an aluminum-look finish. The decorative trim below the retractable monitor sports a piano finish. Carbon inlays are standard, with four additional materials available as options. The headlining comes standard in black cloth, with options for lunar silver or black Alcantara. 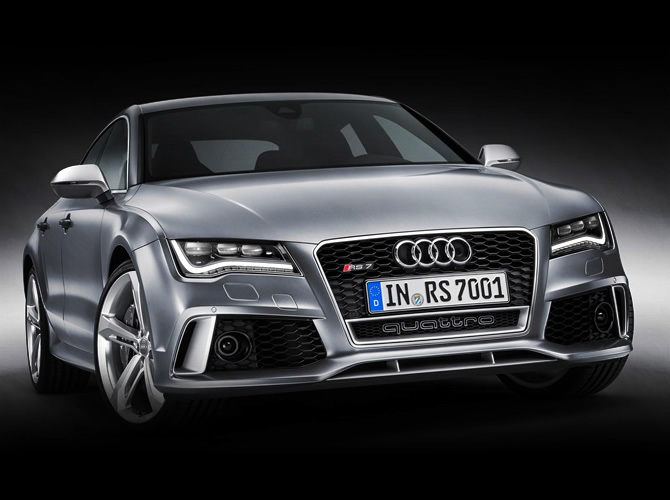 Of course, the Audi RS 7 Sportback can also be personalized using the Audi exclusive program. RS sport seats with pronounced side bolsters, integrated head restraints and RS 7 logos are standard. 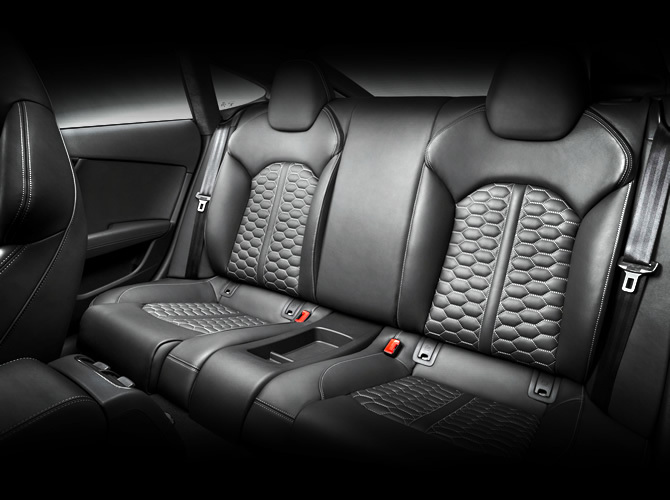 They are covered in a combination of black Alcantara and leather, and the center sections feature diamond quilting. The seats can also be covered alternatively in high-grade, honeycomb-quilted Valcona leather in either black or lunar silver. Audi offers optional power-adjustable comfort seats with memory function. The two rear seats are powerfully contoured. Luggage capacity ranges from 535 to 1,390 liters (18.89 to 49.09 cu ft) depending on the position of the rear seat backs. The Bluetooth online car phone is an ideal complement to the standard MMI navigation plus. Its UMTS module delivers the tailored Audi connect services to the on-board monitor, and a WLAN hotspot connects the passengers’ mobile devices. Topping the range of audio modules is the Advanced Sound System from Bang & Olufsen. 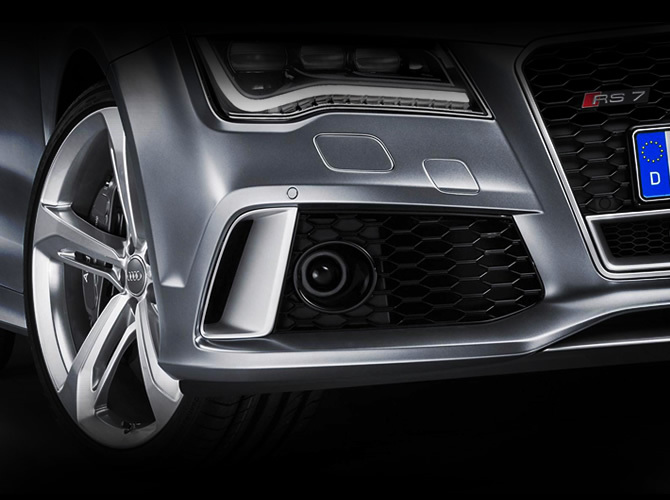 The Audi RS 7 Sportback also leads the pack when it comes to driver assistance systems. One of these is the adaptive cruise control with stop & go function including Audi pre sense front. This keeps the powerful coupe at the proper distance from the car ahead and in many situations can help to avoid accidents or mitigate their consequences.